The biological response to a sustained force is determined mainly by the force magnitude and duration, which generate zones of pressure and tension within the periodontal ligament, their extent and location depending on the intended movement. The cellular response relates to whether a light or heavy force is applied. With a light sustained force, movement occurs within a few seconds as periodontal ligament fluid is squeezed out and the vascular supply is compressed, setting off a complex biochemical response. Osteoclastic invasion occurs within 2 days and frontal resorption follows. When a heavy sustained force is applied, the periodontal ligament is compressed to such a degree that the blood flow is cut off completely, producing an area of sterile necrosis (hyalinisation). Small zones of hyalinisation are inevitable even with light forces, but the area of hyalinisation is extended with forces of greater magnitude. Osteoclastic differentiation is impossible within the necrotic periodontal ligament space, but after several days osteoclasts appear adjacent to and within the adjacent cancellous spaces. From there they invade the bone adjacent to the hyalinised area and tooth movement eventually occurs by undermining resorption. in osteoid, which later mineralises. The normal periodontal ligament width is eventually regained by simultaneous collagen fibre remodelling. With heavy forces, rupture of blood vessels and severing of the periodontal ligament fibres are likely, but these are restored with the remodelling processes. Although the histological response to an applied orthodontic force has been investigated extensively, the mechanism by which a mechanical stimulus effects a cellular response is complex and at present unclarified. 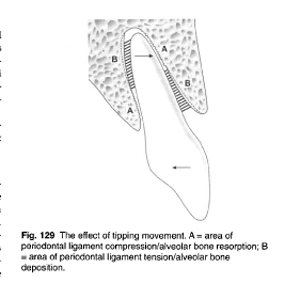 It is likely that vascular changes in the periodontal ligament in areas of pressure and tension, electrical signals generated in response to flexing of alveolar bone following force application, prostaglandins and cytokinerelease interact in the process.